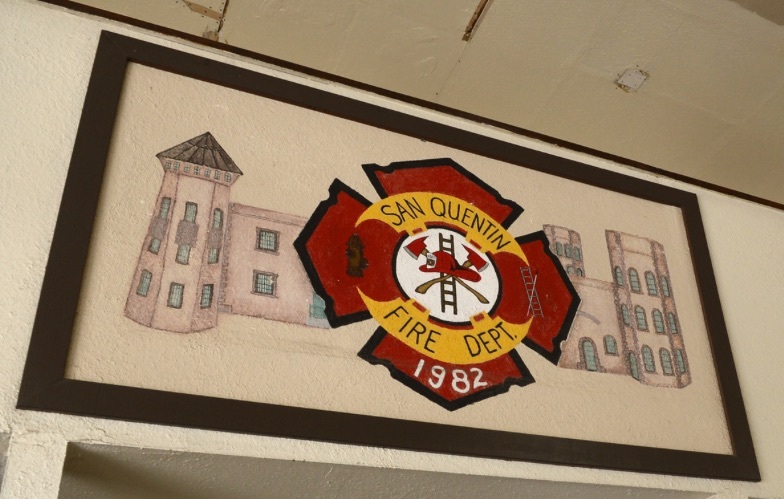 The History of the San Quentin Prison Fire Department, State of California. Located at the Eastern end of the City of Larkspur and San Rafael, south of Highway 580. At the mouth of Corte Madera Creek as it empties into San Francisco Bay, just east of the Larkspur Ferry Terminal. 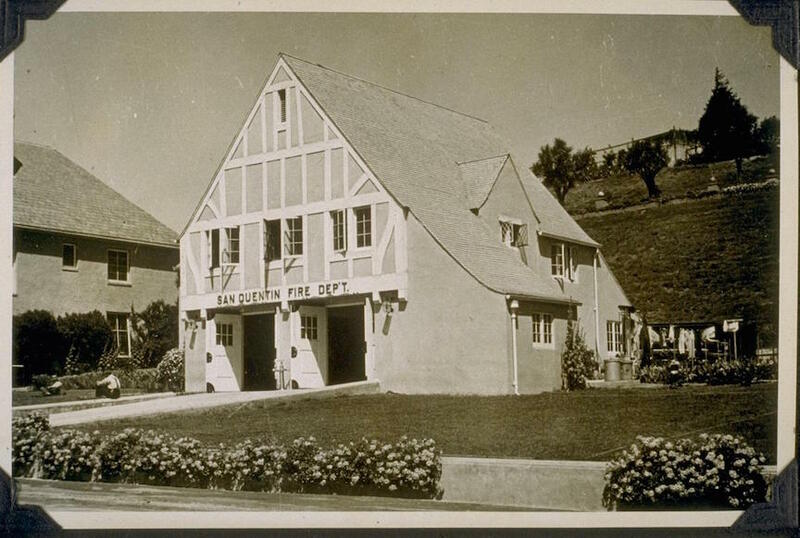 The fire house in the 1930's. In 1840, Point Quentin in the northern San Francisco Bay became part of a Mexican land grant called Rancho Punta de Quentin. Mexican Governor Juan B. Alvarado awarded the 8,877-acre grant to John B.R. Cooper. In 1846 the non-native population of California was estimated to be no more than 8,000, plus about 100,000 Native Americans, down from about 300,000 before the Hispanic settlement in 1769. The loss of the native population was primarily due to Eurasian diseases to which they had no natural immunity. Also, like in other states, the native inhabitants were forcibly removed from their lands by immigrating miners, ranchers, and farmers. On January 24th 1848, in a mountain stream near what is now known as Sutter’s Mill, mill worker James W. Marshall looked down into the water and saw shiny flakes - it was gold. In the Great California Gold Rush that followed, people traveled from every corner of the globe, with most arriving first in San Francisco. Work was hard to find, so some of the new arrivals turned to crime. The city’s jail was small and escapes were common. Seeing a need for something more secure, city leaders set their sights on what they had in abundance – water and empty ships. Many ships bringing immigrants were abandoned, when the sailors and passengers would leave for the gold fields in the Sierra Nevada Mountains. The prisoners were eventually placed on private prison ships in the San Francisco Bay. In 1849, the city purchased the Euphemia for $3,500 and turned the vessel into a floating prison ship. By 1850, the ship began housing prisoners. On September 9, 1850, as part of the Compromise of 1850, California was admitted to the United States. Marin County was one of the original 27 counties of California, created on February 18, 1850. This followed adoption of the California Constitution of 1849, just months before the state was admitted to the Union. According to General Mariano Vallejo, who headed an 1850 committee to name California's counties, the county was named for “Marin”, the great chief of the tribe Licatiut. Another version of the origin of the county name is that the bay between San Pedro Point and San Quentin Point was named Bahía de Nuestra Señora del Rosario la Marinera in 1775, and that Marin is simply an abbreviation of this name. In 1851, the State Legislature passed the Criminal Practices Act, authorizing six counties to set up and operate a state prison in California. Two of these counties, Sacramento and San Francisco, already used ships as county jails for the confinement of prisoners. Various sources indicate the first prison ship established for state government was the Waban, a 268-ton vessel built in a Boston shipyard and abandoned by its crew in San Francisco Bay. A June 12, 1850, edition of the Sacramento Transcript newspaper logged ships coming into the Port of San Francisco. “June 9th … bark Waban, Severin, 200 days from New York.” The ship was reportedly acquired by San Francisco County Sheriff Jack Hays and was contracted with the State of California to be operated as the first state prison ship. The Dec. 20, 1851, edition of the Daily Alta California chronicles the ship’s first days as a prison vessel. “The bark Waban, with about forty state prisoners, was towed over to Angel Island yesterday by the steam tug Fire Fly, with Captain Grifflin. We learn the prisoners are intended to work in the stone quarry, under the direction and supervision of our efficient Sheriff, Jack Hays,” the newspaper reported. Hays had the ship anchored off Angel Island at first, but repeated escapes and insurrections forced the cancellation of his contract. Two other men, General James Estell and General Mariano Vallejo, took over the contract and the Waban. The first order of business was moving the ship. They quickly settled on a location off Point San Quentin in Marin County. The land nearby was called Point Quentin, named after a Coast Miwok Indian warrior named Quentin, who fought under Chief Marin, and was later taken prisoner on this site. The Coast Miwok Indians were hunters and gatherers whose ancestors had occupied the area for thousands of years. About 600 village sites have been identified in the county. The Coast Miwok numbered in the thousands. Today, there are few left and even fewer with any knowledge of Coast Miwok lineage. The state opted for a permanent prison, rather than a ship, and in 1852, they purchased 20 acres of land at San Quentin for $10,000. Later, Estell became the sole owner of the contract. As folklore has it, the Waban arrived there on July 14, 1852, (Bastille Day) with 40 to 50 convicts. On Oct. 12, 1852, a “contract was let for the first cell building,” according to reports. Inmates lived on the ship at night and worked to construct the prison during the day. The building was completed in 1854. San Quentin Prison officially opened in 1852 with 68 inmates. It is California’s oldest State Prison. A dungeon built in 1854 is thought to be California’s oldest surviving public work. On Dec. 23, 1872, the Marin County Water Company brought water from the west from the new Lagunitas Valley dam. About 60,000 gallons of water would be delivered to the prison daily, at a cost of $1,600.00 per month. To supplement this supply, the prison developed several deep wells, with the water being found at a depth of 740 feet. These were the first of many wells developed on the prison site to meet the demand of an increasing population. Warden W.E. Hale served for eight years, from 1891 until 1899. His tenure was marked by several riots and escape attempts, but also with the start of fire protection infrastructure, with several large water mains installed. 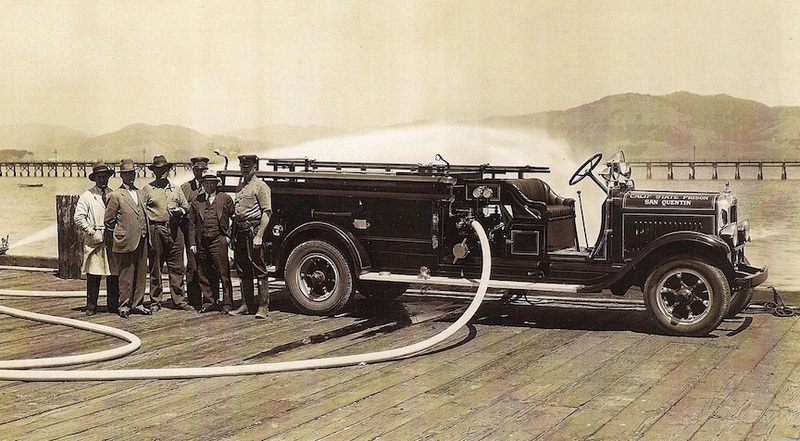 The first building dedicated solely to the fire department was constructed under Warden James B. Holohan, who served for nine years from 1927 until 1936. The first known major fire at the prison was in February 1876, when a blaze destroyed the principal workshops, including quarters for nearly 200 prisoners.